Over the last few months, we have been engaging with and listening to local residents, businesses and visitors across the borough – we have collected some really valuable feedback. Our next step is to explore some of the recurring emerging themes in more detail to properly understand how they could contribute to making Epsom and Ewell an even more attractive and successful place to live, work and study in the future. Councillor Eber Kington, Chairman of the Council's Strategy and Resources Committee, said, "Five months ago, we launched Future40, an ambitious plan to develop a long-term vision for Epsom and Ewell. Since then, it has been all systems go! Over 3,200 residents, visitors and businesses have already taken part, thank you for your interest and feedback. "Your involvement has helped shape the second stage of this project. Please don’t miss this opportunity to give us your views which will further enable us to truly establish what sort of place residents, businesses and visitors think the borough should be like in the next 20, 30, even 40 years’ time." All feedback captured for the second stage will be utilised to create the draft long-term vision for Epsom and Ewell. We will be consulting on our draft vision for the future in the summer. 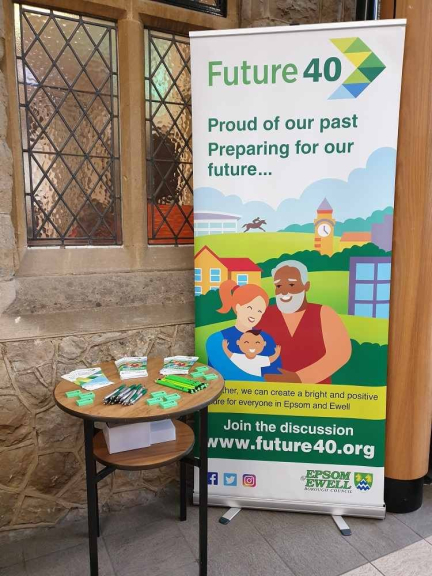 Pick up a paper copy of the Epsom and Ewell Future40 survey at - the Town Hall, Epsom; Epsom Playhouse; Bourne Hall, Ewell; the Community and Wellbeing Centre, Epsom; Epsom Library and Stoneleigh Community Library. Whichever way you prefer, we look forward to hearing from you. You can follow all the action @EpsomEwellBC on Twitter, Facebook and Instagram using the hashtag #Future40.